Fact: Not all the airdrops are worth claiming. Moreover, you need to stay alert so that you don’t get scammed by a fake airdrop. But some airdrops are real and that’s why it is worth looking into them to make the most of the opportunity. In line with that, there is another interesting opportunity that the EOS project is presenting in the form of airdrop of eosDAC tokens. Wondering what EOS or eosDAC is all about? Well, let me brief you before talking about the airdrop. What Is EOS & eosDAC? EOS is a DApp development platform which calls itself “The most powerful infrastructure for decentralized applications“. The main aim of the EOS infrastructure development is to support the development of highly scalable and decentralized application on the EOS blockchain. On the other hand, EOS also understands the governance problem of decentralized blockchains hence it has incorporated a model of DAC or DAO (decentralized autonomous communities or autonomous corporations) through which the whole ecosystem of EOS will be governed further in the future after its mainnet launch. eosDAC: Hence they have proposed the idea of a decentralized community over EOS blockchain and its name is eosDAC. 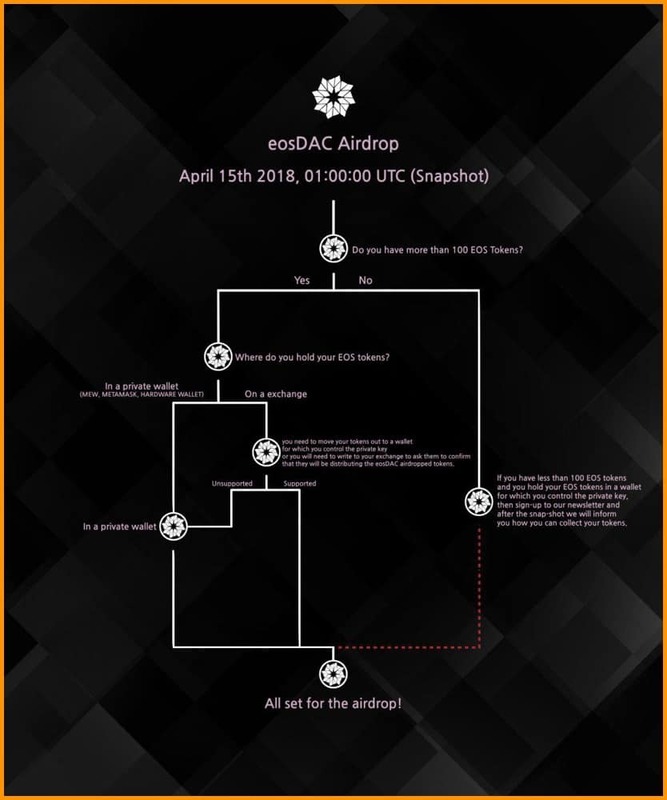 And the eosDAC token airdrop is all about the making of this decentralized community or you can say governance model. To become a leading EOS.IO Block Producer serving the EOS communities worldwide. To become a mother DAC to enable other DAC communities that will come in time on EOS. In doing this, eosDAC will create the tools and smart contracts it needs to function as well share these resources with other EOS DACs that will be there in time. There are huge incentives in becoming one of the main block producers in the EOS system as that producer will receive a significant reward in terms of EOS tokens over-time due the proof of stake consensus mechanism of EOS. And that’s one of the main reasons to become a prominent DAC in the EOS ecosystem. To know about its token economics, you first need to know about BlockMaker Ltd.
75%— of eosDAC tokens to be airdropped to the EOS token holders themselves. 20%— of the tokens have been given to the Launch Team, Advisors and Wider Community Network. 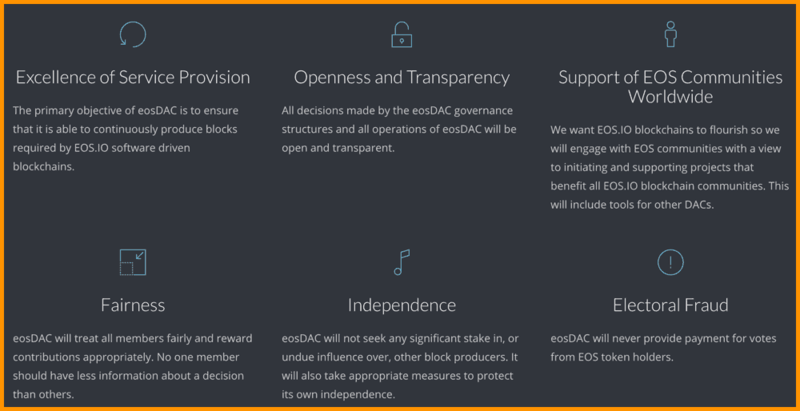 It is so because, without their free contribution of time, energy, and financial resources the idea of eosDAC would not have come into existence. 5%— remaining eosDAC tokens have been given to eosDAC Ltd, which intends to use these for capital reserve. How To Claim eosDAC Airdrop Specifics? eosDAC is an ERC20 token for now but will migrate to EOS once the EOS platform is launched. All EOS token holders holding 100 or more EOS tokens at the end of Day 300 of the EOS crowdsale (i.e. April 15th, 2018, 01:00:00 UTC) will receive 1 eosDAC token for each EOS token. These tokens will be transferred automatically into their Ethereum (ERC20 compatible) wallet where they control their private keys. Examples of such wallets are Ledger Nano S, Trezor or MyEtherWallet. Any accounts with less than 100 tokens will not receive the airdrop automatically but will be eligible (until 15th May 2018) to apply through a manual method that will be explained further in time in their newsletter, so do sign up to the newsletter for updates. Holders of EOS who have their EOS on exchanges need to confirm from the exchanges if they are supporting the eosDAC airdrop. If not, you would need to withdraw your EOS tokens from exchanges to a self-hosted wallet like Ledger Nano S, Trezor or MyEtherWallet before the snapshot. Here is the list of exchanges supporting eosDAC. When is the eosDAC airdrop? The snapshot for the airdrop will be taken immediately at the end of EOS Token distribution period 300 – on April 15th, 2018 at 1 am UTC. There will be a number of checks and tests following this and the eosDAC tokens will be delivered following this period. How will I get eosDAC tokens on an EOS blockchain? When an EOS based blockchain is started, the eosDAC launch team will decide whether to support the chain and add a block producer node (one or more block producer servers). Following this full details of how to activate your eosDAC tokens will be provided. Please note that any eosDAC not activated within 6 months of a chain launch will be lost. This looks like an interesting development but I wonder if it was a part of the plan from the very start or is just a way to gain price appreciation. Irrespective, the EOS token has risen in price after the news and will likely gain more in the next 24 hours. I am also quite skeptical how much this mother DAC will have influence over the EOS ecosystem. Hopefully, it should not be a dictatorial democracy like we have in many countries. Lastly, we will have to wait and see how this plays out in the end and how faithfully EOS blockchain is able to fulfill its promises to the decentralized world. 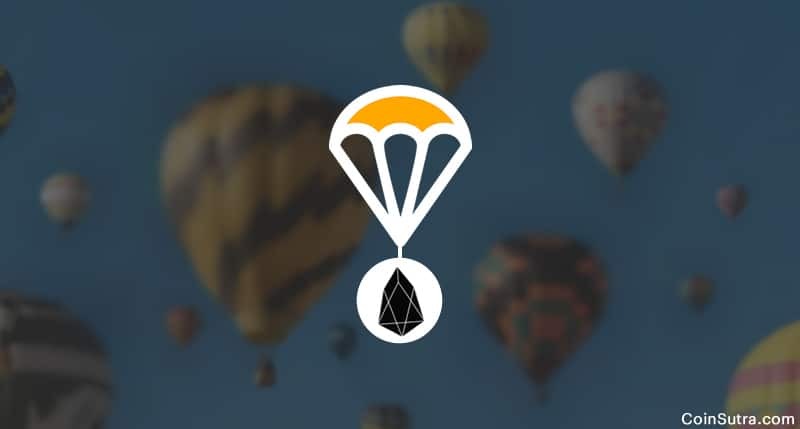 If you have any questions regarding the EOS airdrop, feel free to ask in the comment section below! Also, don’t forget to share the post with people who are unaware of the EOS airdrop. 1 What Is EOS & eosDAC? 1.1 How To Claim eosDAC Airdrop Specifics? Can I use Eidoo wallet for my eosDAC airdrop? Yes, you can as there you control your private keys but don’t keep it on exchanges unless you are sure about them to support EOS airdrop. So if I have my coins registered with exodus exchange I won’t get the airdrop? Exodus exchange? Not heard about it…Are you talking about Exodus wallet? Nope, the drop’s snap is already taken, a bit late. How do I know my Metamask wallet is registered to receive the airdrop? You just need to have EOS on it if you have 100 or more EOS. And if you have less then that you will get the manual process of doing it yourself. So, it sounds like if a person has over 100 EOS tokens on the Exodus wallet, then the EOSDac tolens will automatically be airdropped into the Exodus wallet. Correct? Yes, but the activation of eosDAC has to be done within 6 months of EOS blockchain launch. How do you activate the eosDAC? The activation process will be explained in coming days by the EOS team, stay tuned. I have EOS locked up in a smart contract with ETHLend. Will I still be eligible for the airdrop? I don’t think so, you will get it because you don’t have the keys. Hello, I accidentally sent EOS ERC20 tokens to EOS crowdsale address few months ago. Will I be included in airdrop? No, I think. You have EOS in your wallet of control receive the airdrop. I”m new to all this, but do have over 100 EOS in a MetaMask wallet. What does “the activation of eosDAC has to be done within 6 months of EOS blockchain launch” mean, and is this something that we/I have to do after the Airdrop? Will I get airdrop of EOS if I transfer my EOS coins from binance to metamask ? Yes, if you do it before the snapshot and keep it there till the snapshot is taken. Do my eos tokens have to be registered in order for me to receive eosdac airdrop to my ledger nano s.
Yes, but the process is not yet out. In case you are having 100 EOS or more, you will get automatically and no manual process should be involved as per EOS team. Hi Sudhir- I have my EOS in Jaxx wallet. Can i get airdropped coins? Yes, you will as per the 100 EOS criteria. Subscribe to EOS newsletter they will issue further instructions as per their previous official comment. EOSdac is not exactly something your mother would understand. I’m having a hard time understanding what it is and what is will or can do, and why it is needed. Much like the confusion around all the Steemit coins. Agree, it is quite confusing but we have to deal with it. I have tried my best to explain the same. If I purchased EOS on Binance this week can I send my EOS tokens to a MEW wallet today before the snapshot and get credit for the airdrop, and then send them back on Monday and still be able to receive the drop? Hi Sudhir, I have my EOS in Exodus and have registered them with EOS, what more do I need to do to ensure that I receive the eosDAC airdrop? Should i transfer my EOS to my MEW or MetaMask wallet? Please advise, thanks. No, it should be good in Exodus also as it is self- hosted HD wallet. Wait for further instructions from EOS and stay tuned here. No prob, every question is important and no questions are lame. But if you read the article you will get clarity that manual process is yet not out and you need to wait for EOS to issue it in June. I have my EOS on Kraken (+100). Is there anything I can do now to claim my dac tokens? Please check with Kraken if they are supporting the airdrop, no other way. I left my coins on BNB as I thought that would be supported for airdrop. I’m assuming I”m SOL at this point even though I’ve moved them to MEM since 1 UTC occured a few hours ago? Super bummed that I messed this one up. Not sure about Binance supporting it, but if you had it in MEW at the time of snap you should get it. Can I move the EOS to my binance exchange after the snapshot? or a longer period should be expected at 1:00:00 UTC. Is the photo already taken and can funds be moved? You can move it anywhere after the snapshot time is passed. I gave my eos tokens on Exodus. Do I need to do anything to claim my tokens today? I have over 1000 EOS tokens in my Exodus wallet. I understand that the airdrop tokens will be Automatically put into my exodus wallet. What I’m trying to understand as your comment about the tokens needing to be activated within six months. Please explain. Thank you so much for your feedback. It means EOS will issue instructions on activating these airdropped tokens when their mainnet goes live in June. Great that Exodus does support the snapshot so I am happy as I had over 100. at the time of the snapshot. After the snapshot I moved some of them to MEW – will I still get the EOSDAC based on the number of coins I had at the time of the snapshot or the reduced amount I now have inside Exodus now? HI, I HAVE 102 EOS IN MY METAMASK ACCOUNT AND I HAVENT RECIEVED ANYTHING. IS THIS NORMAL? I have more than 100 EOS tokens in MEW wallet but I did not receive any airdrop token so far…why? Same for me. Not sure what others see on their wallet and where it is . Public address pls? Have you added eosDAC custom token in your wallet? another thing is i still havent moved to any vallet…i wasnt aware of that…what if i move today will i be still eligible for airdrop? Hi , It is very helpful for me to understand the processes related to the airdrop after reading your comments to people’s questions. Thank you. I have only 50 EOS in my Exodus wallet. I tried to subscribe to the news letter to get information but failed (the subscription page was inactive). What should I do now? oh, I see, but that was their official stand on it, can’t help it. Have you received anything on your ETH address on which EOS is there? Have you checked it on etherscan? hello, I have less than 100 eos and I Want to know how to claim eosDAC drop manually ? Sign-up to EOS as mentioned in the write-up for more updates. Hi Sudhir- I had my more than 100 EOS in Jaxx wallet. How can i claim my EOSDAC? if I reveived some eosdac but my address is not present. Why? How can I do? thanks! Provide your public address on which you had EOS pls to further analyze. Hi Sudhir- You did not reply to my earlier comment. I had more than 100 EOS in Jaxx wallet. How can i claim EOSDAC? Did you once check in etherscan.io, if your ETH has been dropped with eosDAC? Pls, provide the public address if possible. Hi Sudhir- Thanks for replying. I did check on ehterscan.io. it says Tx receipt status as success.It gives me from address and To (Contract address) but i am not sure how can i get them in my Jaxx wallet. Can you pls help? Can you give me your public address, I can further see and assist you on the same. BTW As per EOS the tokens will be activated after the mainnet launch only. I have,my Eos on binance. When and how do I receive my eosdac? Ask Binance to provide it, no other way as of now if you had it on the exchange. Hello Sudhir, righ now is already pass the airdrop day, I hold EOS on Binance before, but they are not support this airdrop. If I transfer the EOS from Binance to Huobi, can I still get the EOSDAC? thanks! No chance now, you need to ask Binance for providing it to you now. I had EOS in my Exodus wallet but never received any of the airdropped tokens. What did I do wrong? Pls try once adding eosDAC custom token in Exodus it should be seen then or else just check your receiving address in etherscan.io to see if you see something in the token section. Or pls provide me your public address of Ethereum on which you had EOS tokens. I am on binance which held my EOS coins how do I get the new coins? Hello Sudhir, I’ve just received my Eos dac on my Meta Mask Wallet. However I still have my Classic Eos too. If i sell my classic Eos, my Eos dac will stay in my wallet? Do you need my EOS receiving address on Exodus to help me locate my EOS air dropped tokens? Thank you for your much needed assistance . I have less than 100 EOS tokens on Binance. If I move them to MEW now could I still get the eosDAC airdrop or did I miss it? Yes, you will get as you will be in the snapshot. Pls refer to EOS official newsletter for more updates on less than 100 EOS. i guess i was to late tobe notified about this beautiful platform. i have 94 eos token now on koinex. is it of any advantage in term of eosdac token that can be recieved as replica to it. please update on what should be future course of action w.r.t EOS token patform. Just remember you MUST register your MEW address with EOS before the June cut off date. Probably also best to do now to make sure you get future air drops. the requirement of registration before June cut off date is only for those who hold less than 100 EOS, am I right? No you MUST register your EOS tokens irrespective of airdrops. Go to eos.io, scroll down to GET EOS and click on that. Check the 5 boxes and click on continue. Scroll down to Participation Instructions, click on register. Click on Myetherwallet and follow the instructions. That registers your MEW address with EOS. So any further EOS bought and placed in that specific wallet address will be good once the EOS ICO ends. So you are registering this address not specific EOS tokens. Many thx again! To register my MEW address, I followed very carefully the instructions of registration in the https://eos.io/instructions……..unfortunately, the very last step “Generate transaction” was blocked by Windows of my computer (i think there should be some kinds of firewall in the Window security setup). I tried many times but same thing happened. I am not an IT guy. I didn’t know how to resolve it……finally I gave up. Now I can only choose to open an account with Binance which shall support the token swap on 1 June 2018. One thing still bothering me is after the token swap at Binance, there is no way to safely keep such new EOS tokens because there is no cold wallet available for the new EOS tokens (which are no longer ERC 20 tokens and thus cannot be transferred back to my MEW wallet). Do you have any suggestion? Nope but you can expect full node clients of EOS being ready by then. Once mainnet is launched there will be an official eos wallet you can download and store the coins. Just google register EOS tokens and you’ll get several articles that explain everything. Many thx for your advice! May I ask such registration of my MEW address with EOS tokens at the eos.io is a must-do procedure for the so-called “token swap” from ERC-20 token to EOS MainNet token before 1 June 2018? There are a couple of platforms that will apparently support the EOS token swop ERC20/EOS mainnet. I think its Binance and Bitfinex but not sure so you need to check and confirm that this is correct. I don’t know if this support will include future airdrops (last I read we are up to 29 coming), or how future airdrops will work post EOS main net launch. Haven’t yet received the airdrop to my eth wallet (also checked ethplorer and etherscan and not showing there either). Do you know how I can check whats happened? Found out you can go to https://eosdac.io/airdrop/ to find out your DAC status and when you will receive. Thanks for airdrop update Sudhir! IMO only Binance is supporting that swap you are talking about. So I transferred my EOS from myetherwallet to my Nano ledger – and only today did I transfer them back. Would I still get the EOS DAC? Also where would I be better leaving my EOS on myetherwallet or on an exchange? Hi… I’ve got over 100 Eos tokens and have registered them on myetherwallet.. but I’ve done all this after the airdrop! I know I won’t of received any dac but will I receive future airdrops? Huobi is supporting quite a many EOS airdrops. You can keep EOS there for a couple of days. Do enable 2fa and other security stuff.